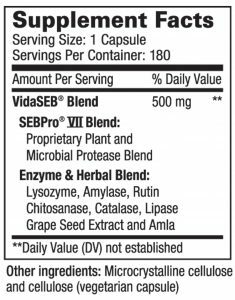 The unique blend found in Vida-Defense includes a potent, proprietary blend of plant and microbial proteases SEBPro® V. This is combined with a powerful blend of antioxidants, enzymes and herbs, including lysozyme, amylase, rutin, chitosanase, catalase, lipase, grapeseed extract and amla extract for complete, broad-spectrum defense support. 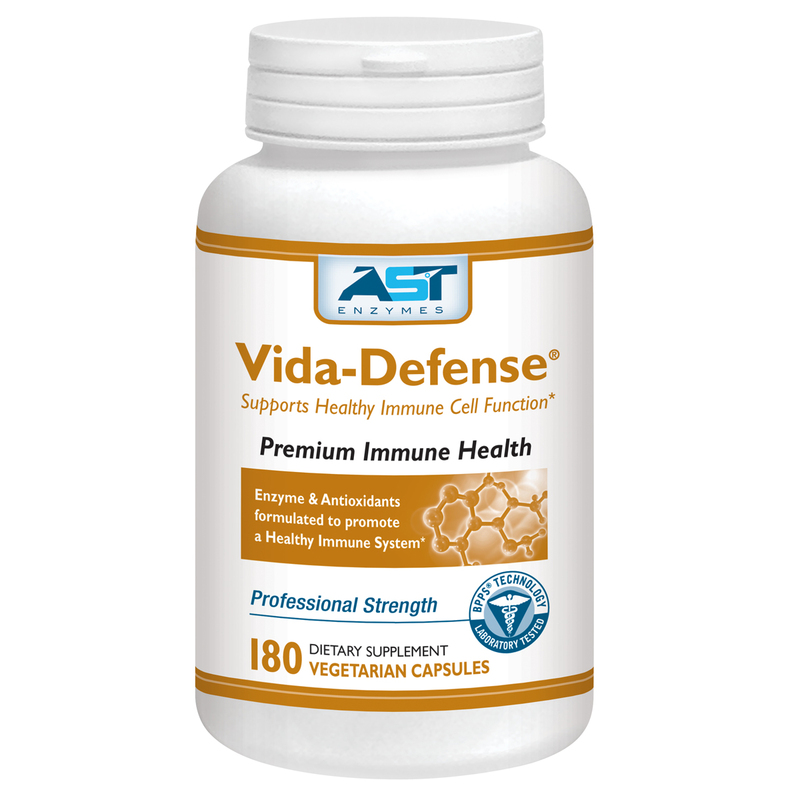 Vida-Defense incorporates multiple potent antioxidants, including catalase, grapeseed extract and rutin. *These statements have not been evaluated by the Food and Drug Administration. 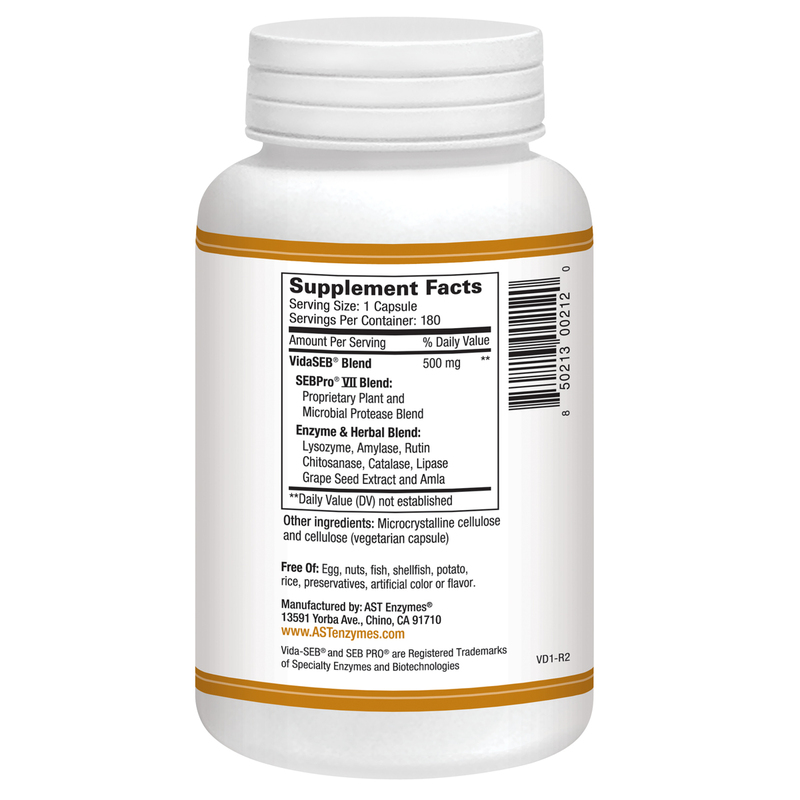 This product is not intended to diagnose, treat,cure,or prevent any disease. Directions: Take 1 to 2 capsules three times a day on an empty stomach. 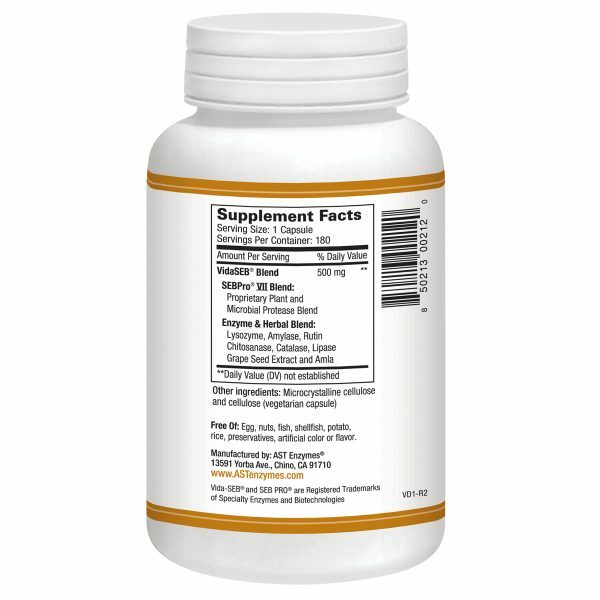 Take capsules at least 30 to 60 minutes before of 2 hours after a meal with 8 oz. of water. Store in cool, dry place with the lid tightly closed. Avoid excessive heat. Keep out of the reach of children. Systemic enzyme therapy refers to the therapeutic use of enzymes to support healthy cardiovascular, respiratory, immune systems, among others. Systemic enzymes are absorbed from the small intestine where they enter the bloodstream and execute their effects on the entire body as a system. Different systemic enzyme blends offer support to different areas of the body. 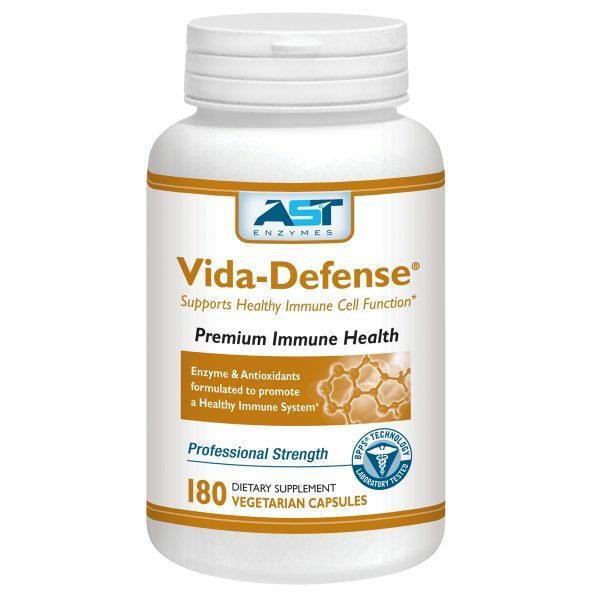 Vida-Defense is packed with potent proteolytic enzymes at high activities, and antioxidants required for supporting a strong immune system. Proteolytic enzymes break down proteins into their building-blocks, which are called amino acids. Systemic proteolytic enzymes are responsible for breaking down accumulated protein and waste substances found in the circulatory system and connective tissue. How long should I take Vida-Defense before feeling results? The length of time to experience the benefits of systemic enzymes varies by individual. Some people notice a difference within days. For others, it’s a week or 10 days. For long-term benefits, it’s important to take systemic enzymes consistently over several months. Regular, consistent use of systemic enzymes will provide the best results, however missed doses of systemic enzymes do not have serious repercussions. Although symptoms alleviated by systemic enzyme therapy may resurface, getting back on track by remembering to take your next dose will suffice. There is also the option of incorporating another dose during the day. There is no need to “double up” on one dose. Also remember, systemic enzymes are best absorbed on an empty stomach. Why is it important to take Vida-Defense on an empty stomach? Since most absorption occurs in the small intestine, the systemic enzymes survive the stomach intact. If enzymes are taken with food, they will likely begin working to break down your food within the stomach, rather than passing through to the small intestine. Taking systemic enzymes like Vida-Defense with food will compromise their absorption, as well as their effectiveness. Are there any side effects involved with Vida-Defense? The use of Vida-Defense has not been shown to exhibit detrimental effects, long term or short term. Minor side effects may vary. Gastrointestinal disturbances have been reported by a small percentage of new users, but once the dosage is adjusted, tolerance is maintained. Minor allergic reactions, like reddening of the skin, are also rare occurrences, and can be seen with extremely high doses. There are no known interactions with prescription or over the counter drugs while using systemic enzyme therapy. However, it is recommended that you consult with your physician about starting systemic enzymes, particularly if you are on blood-thinning medications, or are pregnant or nursing. 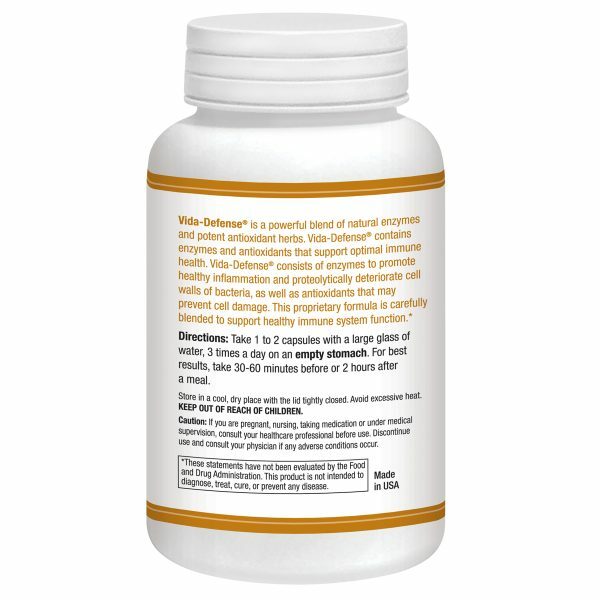 Can I take Vida-Defense with other systemic or digestive enzymes? Systemic enzymes may be taken together, yielding desirable results, as long as they are taken on an empty stomach. In fact, it is often recommended that systemic enzymes be combined. Separate blends or enzymes often work together to produce advantageous results. By combining and enhancing the activity of the enzymes, their effects on supporting the body are more attainable. The small and large intestines play an important role as the first line of immune defense. One of our most popular products, Floracor-GI supports microflora balance and gastrointestinal health. 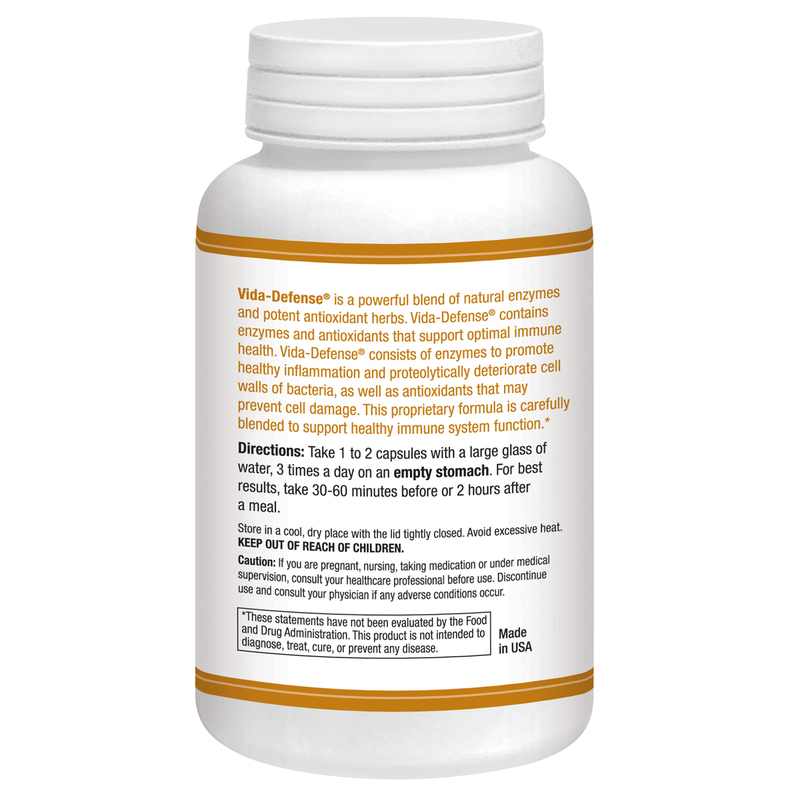 Combine Floracor-GI with the blend of powerful systemic enzymes found in Vida-Defense to support gastrointestinal and immune health. Digestion is at the core of good health. DigeSEB-GI is a broad-spectrum digestive enzyme blend to support digestion of all types of foods. DigeSEB-GI supports digestion and nutrient absorption. Sign up now to receive newsletters & promo codes!